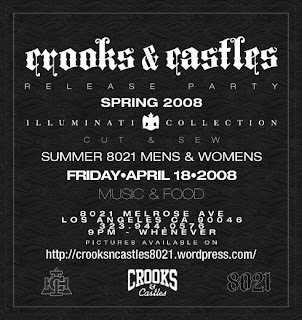 Crooks & Castles is launching the spring illuminati, mens and womens new 8021 tees and cut and sew collections on Friday, April 18th, 2008 at the flagship store on Melrose in BH, California. 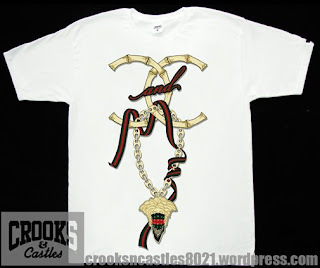 Visit the Crooks & Castles blog, so that you can see how-They do it! 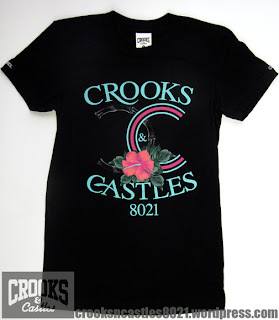 It looks like the Crooks have been doing some BALLLIN' lately and eh em, I don't blame them. 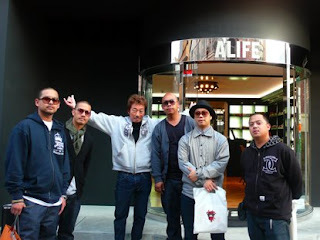 From what I can see of the new apparel they have been working quite hard on the designs and I, personally, give them permission to take a short break. But quietly, no one in the fashion industry takes a break. Believe me, if you are travelling, while doing so you are sourcing new fabrics, looking for manufacturers, seeking inspiration or just down right benchmarking the fashion industry as a whole, wherever you may be on the globe.